My brother has been telling me about this site in Mississippi that has 75 million year old shark teeth and other abundant fossils washing out in a creek. We have tossed about the idea of making the trip, we scheduled one for 2 weeks ago and we promptly had a 3 day deluge making it pretty much impossible to go around wading in any creek. Then this past weekend, Sat 21st, June, we managed to hook up and make our way to northern Mississippi. We were slow out of the gate, we didn’t get out of here till 9 AM and met up with my little brother, who happens to be 6′ 3″ and 265 lb. He is at least 3″ taller than me, outweighs me by 50 lb. and honestly we don’t get to see enough of each other. We always have a good time when we manage to get together. Our expedition consisted of my brother and his 5 year old, high functioning autistic son, and me and my wife along with the 2 brats still living at home, both boys 17 & 12. We arrived at Twenty Mile Creek located near Frankstown Miss., right off of State Route Hwy 45, just around lunchtime. This is a well known fossil hunting site that requires no permit or fee to participate. When we arrived the place was busy, apparently 2 archeology clubs decided that the day we managed to make it, was some sort of field trip for them. After a 3 hour drive and 2 years of planning we were not to be dissuaded and we grabbed our gear and waded in amongst the fray. My brother being a return visitor had 3 shaker boxes built, which we managed to aquire 2. These boxes measure around 18 x 24 inside diameter, with a hardware cloth grate probably in the 1/4 inch range. We were also packing a couple of hand held gardening tools, two resembling a small spade shovel, and I had a short flathead shovel as well. We divided into 3 groups and started digging. You dig up material from the creek bed and drop it into the shaker box, then with the box still in water, shake. This obviously removes the sand and grit and leaves an assortment of filtered material to sift through. 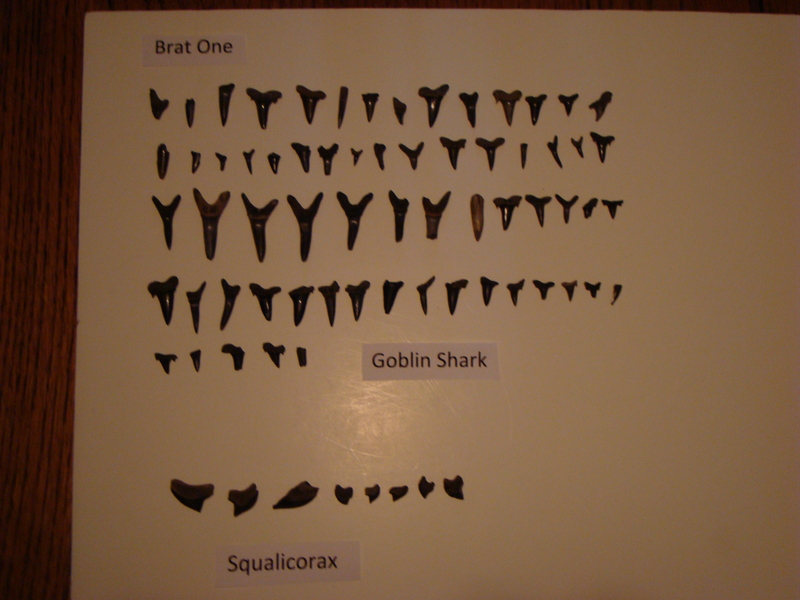 Right away the shark teeth were being found with my brother and my elder brat (brat 1) having the more significant luck. They were consistently saying “oh look another one” and “hey look at this” or “so you find anything yet?” Let’s not forget this one, “look for the pointy things.” After the first hour I had not found the 1’st tooth and these guys were raking them in, and not a bit afraid to rib me about my terrible luck. At one point I told my brother I was wielding a shovel, a multi purpose tool, fit for whacking someone over the head with, AND digging the hole to put ’em in. There were puns and jabs and much good natured back and forth. At some point my wife fell and scraped up her shin pretty good, and she retired from the dig. Eventually I started to have a little bit of luck finding a few teeth and other assorted fossils. By the time we decided to take lunch we had been there for 3 hours, and were well in need of a break. After an hour or so, the consensus of the group was to call it a day on the dig. We did however decide to hike the creek for a bit. We went downstream first, there was supposed to be some sort of waterfall, we got there and it was essentially a dammed up spot that created a spillway of sorts. Unimpressed we turned back and hiked upstream for a bit. It was during this leg I found a pretty cool shell later identified as a “exogyra ponderosa” a nice specimen, probably weighing in at nearly 3 lb. When we got home the tooth count went like this: Brat one 82 teeth! (some only partials.) 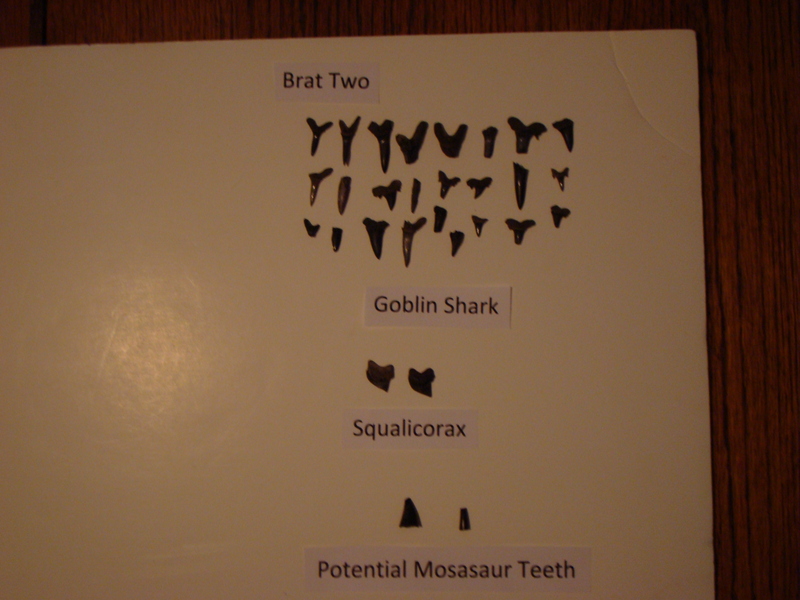 Brat two 29 teeth, two of which tentatively (maybe, possibly) identified as mosasaur teeth (one whole, one broken). 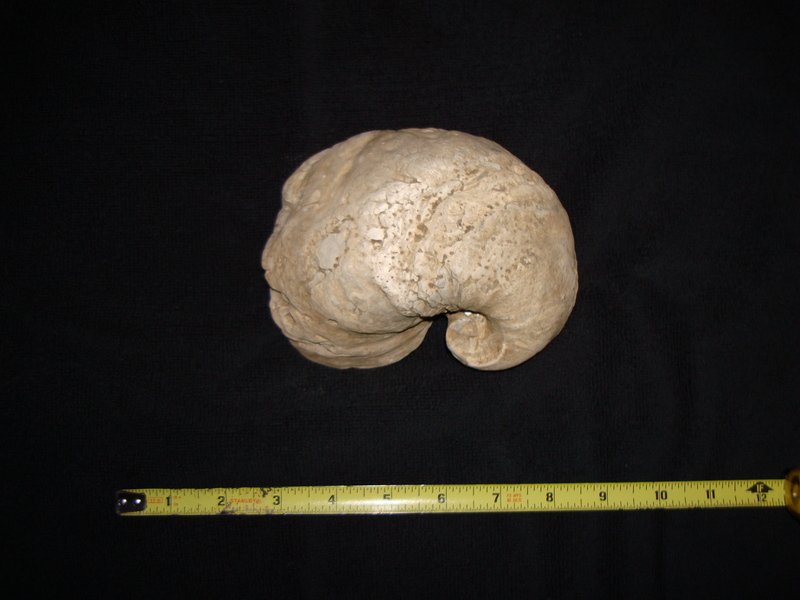 My count was a paltry 13 teeth, a few assorted fossils, and one big shell. My brother had I think around 20 teeth. After some Googling I found a document assessing the Frankstown site, a comprehensive study identifying the fossils there. It also details the discovery of the site among other things. This doc (Adobe file) is now saved on my hard drive for frequent access. 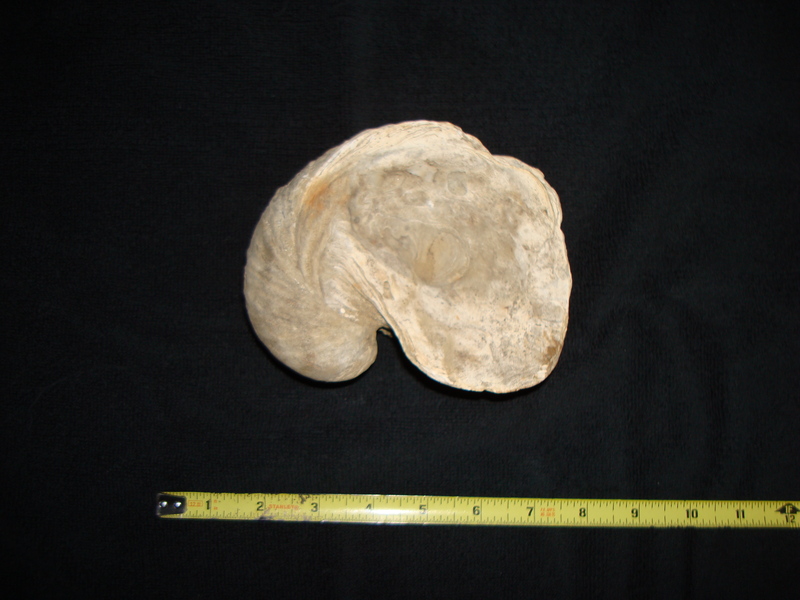 You can see this doc here: http://www.deq.state.ms.us/Mdeq.nsf/pdf/Geology_Circular-AGuideToTheFrankstownVertebrateFossilLocalityUpperCretaceous_PrentissCountyMississippi/$File/Circular%204.pdf?OpenElement EDIT: I have no idea why my luck with posting links is roughly equal to my luck at finding shark teeth, but a copy/paste will get you there. 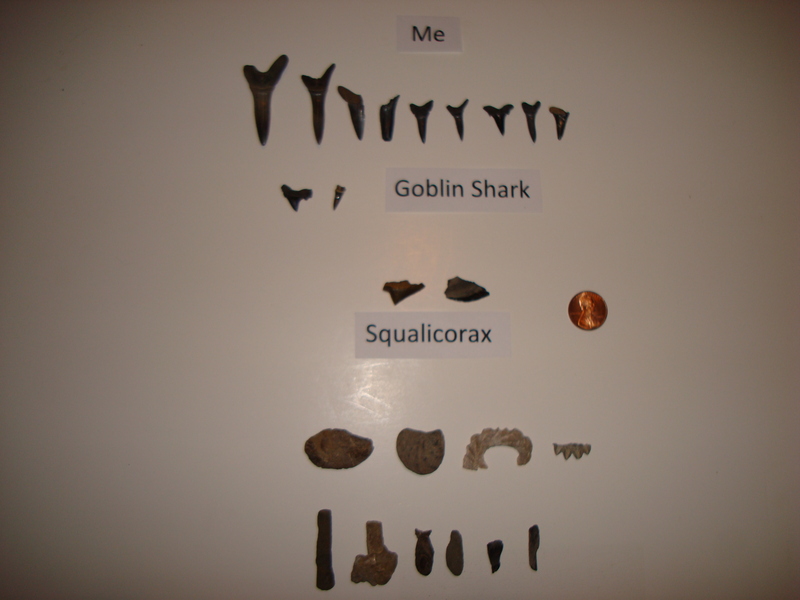 …and finally my pitiful take, with some assorted, as of yet unidentified fossils. To be sure, all of the teeth identified here are at best tentative, I am a total noob in this area of study. I have my learning cap on though. That’s it for this trip. There will be more. This stuff is too fun!